This is a multiple part series for someone new to wireless hacking, with pictures and videos. Crunch is a useful program for creating and outputting wordlist or dictionaries to be used with brute force attacks. 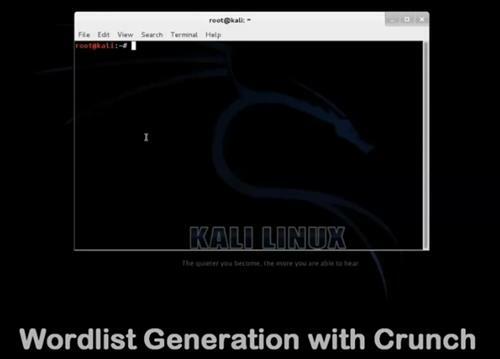 Crunch can send a wordlist to the screen, file, or another program. Here is how to create a dictionary with Crunch. Pattern = Some characters can be static or dynamic meaning you can specify letters to change or not change. For example, if I want to create a minimum 7 digits, maximum 7 digits, qwer987 with pattern qwe@@@@ and to save the file in the desktop folder. xyxyxy where x=aeiou and y=bcdf and than yxyxyx then,yxxyxy,, but never 3 x or y in a row. Really nice tutorial. But how to find password without dictionary? Is there any application witch will create wood check it with handshake , delete and create smarter? Last time I create dictionary it was over 200 GB and didn’t contain password.